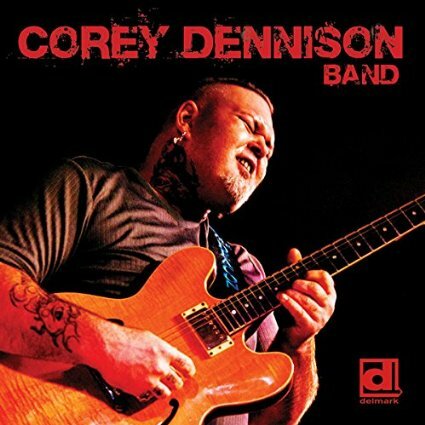 I just received the self titled release, Corey Dennis Band and it's way cool! Opening with Getcha' Pull!, Dennison, who has an incredible voice and also manages lead guitar is joined by Gerry Hundt on guitar and organ, Nik Skilnik on bass and Joel Baer on drums. This opening track has a little bit of rural country flavor with an easy picking rhythm but his vocals are truly off the hook! On Tugboat Blues the track oozes Chicago with a hint of Mud and a Hint of Elmo. I like Dennison's open guitar styling with a cool understated strut. Excellent! The Deacon is a high stepper with a funky underbelly. Just listen to this guy sing. Firm guitar riffs and a driving bass and drum lines carry Dennison proudly on it's shoulders. Room To Breathe is a laid back R&B style track that is bound to hit the airwaves (and encourage lots of couples to the dance floor). Very cool! City Lights also has a funky R&B carriage and Dennison not only sings the blues, he picks it well. Each track on this release reinforces that this is for real. She's No Good swings back toward the country styling but with roots in Gimme Back My Wig of T for Texas. Country style picking and riding snare/hi hat define the track but the blues prevails. Very nice! Aw, Snap! really digs in with a nice bass groove. It is like James Brown playing with Albert King. I love this track. It's great! Don't Say You're Sorry conjures feelings of the impressions. You can see where this guy lives. Super vocals, blending and feel. Ok. You been waiting for that slow, screamer. Here it is... A Fool's Goodbye. Dennison plays stinging guitar riff after riff behind his lush vocals. Skilnik sets down a really nice bass line giving Dennison the floor to Albert King it up and King it up he does. It doesn't sound like Mr King himself...nor does it sound like SRV doing Mr King, but in the big picture... this is great. Dennison has King's spirit and with real nice rhythm guitar by Hundt, Dennison squeezes the neck till it squeals and his vocals are spot on. Excellent! Jasper's Hop is a cool instrumental with traces of the MG's. Understated guitar riffs with clean articulation makes this track sing. Shame On Me has a really nice groove... a bit of funky under the soulful blues. I can't say enough how much I like this guys voice. His voice has just the right amount of grit but smooth and his phrasing is perfect. With Skilnik riding a nice groove, Dennison lays out really smooth riffs. Excellent! On Strange Things Happenin', a driving James Brown style track, it's Baer's drumming that drives the train with Skilnik riding high but again Dennison shines on vocals and his guitar talks for itself. Chicago style blues number, Good Enuff, wraps the release with a great swagger. Dennison sits on the beat and wails on vocals. His guitar work is tight and precise. This is a very nice closer to an absolutely excellent release! Spot on review. Thanks for putting into words what the rest of us hear. Great review. Thanks for putting into words what the rest of us hear. Love the CD.